If you love cats and want a laid back card game themed around cats, then you'll love Kitten Caboodle. Game play is very similar to Go Fish. Players will be asking other players if they have a specific card to help them complete their cat cards by collecting all the items the kitten is thinking about. 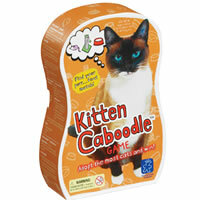 Kitten Caboodle is very easy to learn how to play and great for almost all ages. The fun cat illustrations and simple items are fun for kids to see and ask for. Suggested in the game rules is the stipulation that you need to talk like a cat. For example: "Do you (meow) have the scratching post (meow)?" Check out Kitten Caboodle today! The winner is the player with the most cats. Inside you'll see 7 stand-up kitty-cat game pieces, 28 cards and the official Kitten Caboodle game rules and instructions. Please keep in mind that the official Kitten Caboodle childrens rules and instructions could be different depending on the game version you have. The rules below are some of the exact directions on how to play Kitten Caboodle. Share with us your comments, funny stories, tips, advice, strategies, creative ways to play, questions about how to play, problems with the rules or anything you want about Kitten Caboodle. All submissions will be reviewed within 24 hours. Click here to add your Kitten Caboodle comments.